It is nearly midnight on Christmas Day, and I should probably be fast asleep by now, bearing in mind that they dragged me dahn the pub at 11.30 this morning! The Missus has done the chauffeuring all day, Morecambe & Wise are Singing in the Rain on the telly, and I thought you needed to see this fascinating postcard that I obtained a couple of months ago. In order to work it out, here’s what you need to know. 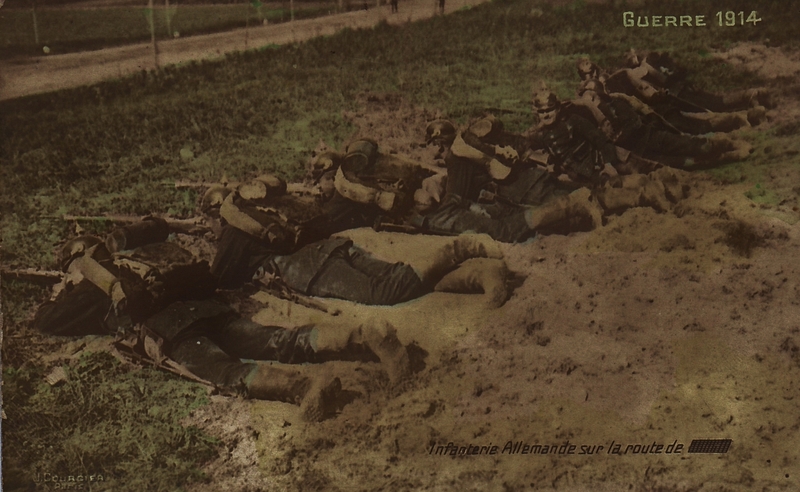 It’s a French postcard, it says Guerre 1914 (not 1915, nor 1916, nor Grande Guerre, just Guerre 1914) at the top, and at the bottom it says ‘German Infantry on the road to’ and then a black oblong, which is pre-printed, not censored. And then there’s the date written on the back; 24th July 1914 (see above). So what exactly do we have here? A postcard dated four days before Austria declared war on Serbia, and a week before France (3rd August) & Britain (4th August) declared war on Germany, featuring a coloured photograph of the German manoeuvres that took place in the summer of 1914; note that you can see two people at the top of the photograph who appear to be watching whatever is happening. 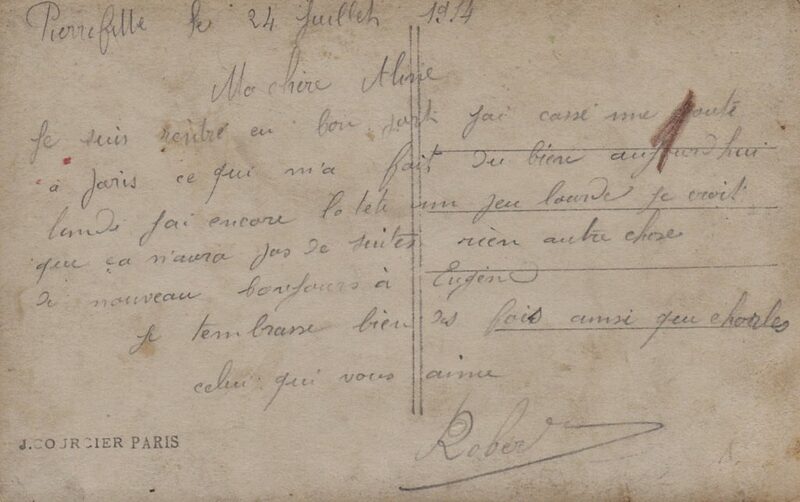 The firm of J. Courcier, a well-known Paris postcard publisher, who printed the card, seem pretty clear about what’s going on; the Germans are coming, you can add your own town or village to the end of the ‘German Infantry on the road to’ sentence, and it’s going to be soon (1914)! Interesting, eh?